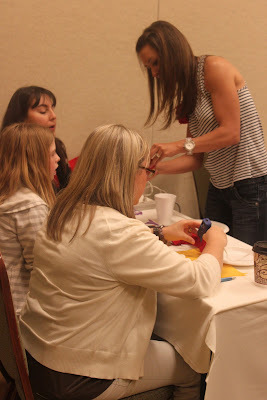 A few weeks ago, I had the pleasure of teaching a 'craft class' to the women of One:Twenty One Community Church. 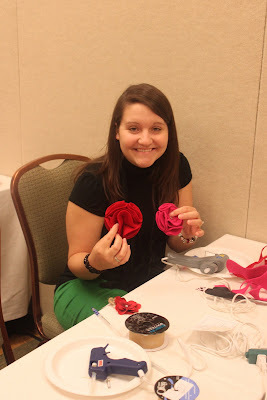 Over 135 women gathered at the DFW Hyatt to relax, worship, and craft. We made my "Texas version" of the felt flower pin. My sister Becka was kind enough to come along and act as my assistant/photographer. We brainstormed ways to wear the pins- we thought of everything from attaching them to elastics or alligator clips and putting them in your hair to clipping them on flip flops or pillows! 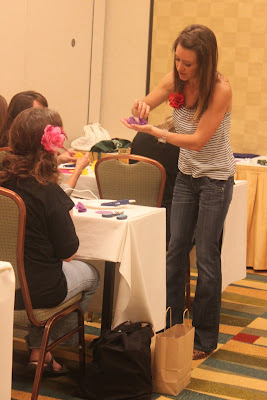 It was so uplifting to be around so many positive, crafty women. I love the yellow felt flower pin against her gray sweater. Or how about her daughter's teeny tiny flower? She is planning to put that flower in her hair. And if you are a crafty woman (or want to be!) you may be interested in reading an article I wrote several years ago when my friend Jennifer and I were making our rounds on the 'Craft Fair Circuit'. The article features helpful tips for anyone who is embarking on the fine art of what my husband calls, "Moving the Merch". Check it out at Polka Dot Mom- by clicking here. You are so cute!!! I need to make myself a flower pin...and what fun little "happy" gifts they might make for friends! Easter edibles are so cute!